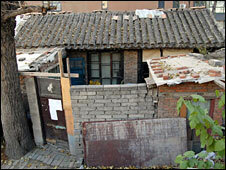 A well-known Chinese activist has lost her six-year battle to save her traditional-style Beijing home from demolition. 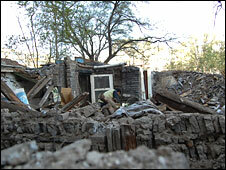 Workers have torn down what remains of Ni Yulan's courtyard house, although she was not personally there to see it. The former lawyer is in a detention centre awaiting trial on charges linked to the destruction of her home. 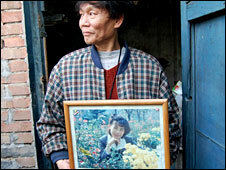 Her husband, Dong Jiqin, says the demolition was illegal, although it was approved by the local court. Mr Dong said: "They are using legal means to destroy people's rights and there's nothing I can do about it." Ms Ni, 48, has battled since 2002 to save her home, in Beijing's Xicheng District, which she shared with her husband and their daughter. She has also helped defend the rights of other ordinary people threatened with forcible eviction from their homes. As China rushes to modernise, ordinary people often complain they are forced to move to make way for redevelopment projects. Ms Ni had been arrested several times for her activities, and claims she has been beaten by the police. She now walks with the aid of crutches. In April this year she was arrested again when workmen came to pull down a wall surrounding their home, according to her husband. He said that in that incident she was hit on the head with a brick and dragged to the ground. She was later charged with "obstructing public duty". The campaigner's trial was due to be held just four days before the start of the Beijing Olympic Games, but it was cancelled at the last moment. Her lawyer, Hu Xiao, said no new date had been set. Under Chinese law, she can be legally held in detention until the end of next month, he added. Ms Ni, whose home was demolished to make way for a redevelopment project, is reported to be in poor health. "She's not too bad, but she is very thin and because she's disabled it not very convenient to be in detention," said the lawyer, who saw her recently. Workmen, watched by police and local government officers, have been on guard outside Ms Ni's home for some time. Last week they started knocking down the few remaining abandoned homes in the area. Most people have left, according to Mr Dong. But despite an official notice on his door also ordering him to leave, the 56-year-old said he was unwilling to abandon the home his wife had fought to save. "I've no other option than to use the media to make my viewpoint known," said an emotional and dishevelled Mr Dong as he stood outside his home before it was torn down. As the official notice on Mr Dong's home confirms, the authorities believe they have acted according to the law. China recently claimed ordinary people's legal rights will be enhanced in the future. The country's says it plans to publish its first human rights action plan that will strengthen the rule of law, expand democracy and improve people's lives.